[May, 2017] I had this dram at the distillery during the Feis Ile (served generously by Jackie) and later another one during a Feis Ile tasting at Bonn. As I did not like the Kelpie Committee Reserve (KCR - I scored it 81 points) I had no big expectations on this, especially after Mickey stated that this is just a diluted KCR (so no new batch as with Perpetuum, simply the same stuff at a lower abv). But even these low expectations are not met: The nose is strangely cheesy (what I did not find in the KCR) besides the herbal aromas (camphor, sage). The mouthfeel is okay but not impressive. On the palate the bitter notes are not as powerful as with the KCR but the whole taste is somewhat weakish/flat. The finish is medium and very sweet but it dries out (paper, cardboardy). PS: A limited release of 60.000 bottles - could all investors please turn on their brains??? Well, what should I say? Here I am with the strong. Nice part no question. Not more but also not less But do you have to make such a hype out of it? Yes ! I think Ardbeg and the fans need that. Hunt and be hunted. No smoky Ardbeg, a sooty sea. Phew what a smoke. Somewhat different than the other A. Beg's :) Here's a coal dust. Or, as if someone has lit a charcoal grill. Herbs and flaxseed pull through your nose. 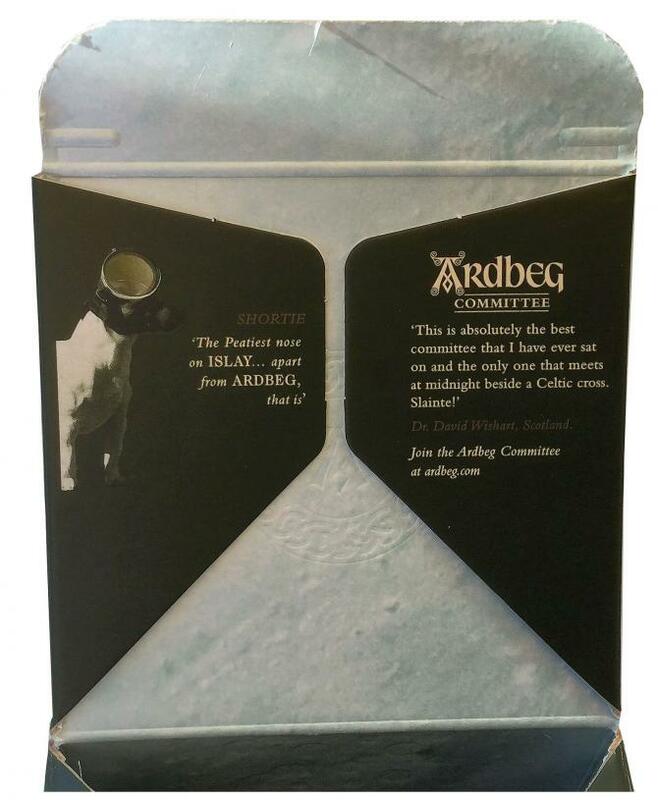 But then comes the typical Ardbeg sweetie. Somewhat later ! Like someone and another rubber tire thrown into the charcoal. Some maritime, sea algae, nuts and vanilla come through. Here he is the old man again. Jau does not just smell, it also tastes of burned charcoal. Really sooty. Madness The really gives off gas and smoke on the tongue. In the background there is still some wood and bacon strips. medium - maybe a bit disappointing I would have expected something more. Interview with dr. Bill Lumsden on Ardbeg Day (03.06.2017): "It's a limited edition and we only filled 60,000 bottles." 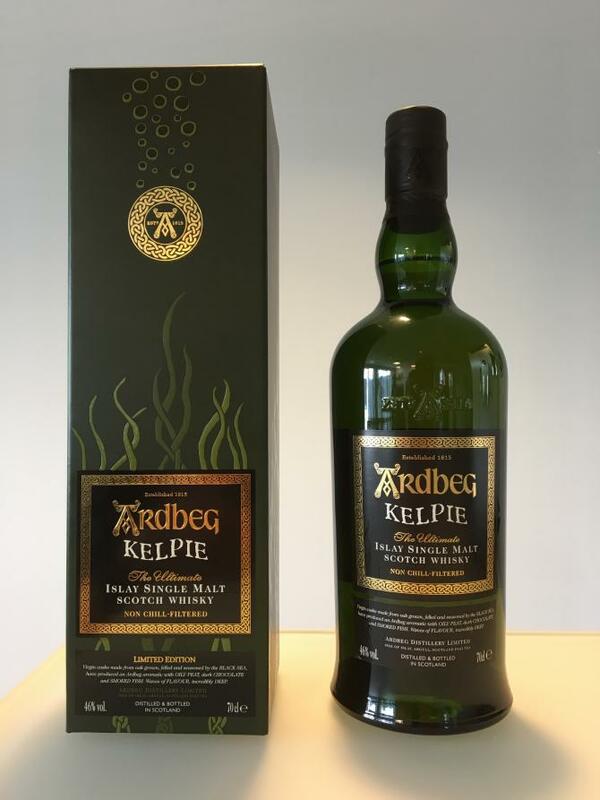 The Kelpie is a massive whisky, with rather extreme flavors from the fresh Black Oak. Something I find extremely successful as an experiment, that is certainly not mass compatible. Almost light at the beginning, dry, a bit shy, with a sourish fruitiness, linseed oil, a bit musty, the oak is not directly recognizable, but more associable with the musty sourish. The peat is amazingly discreet, but quite dirty, sooty, menthol and after some time with a sweet tip. Over time, the nose is getting darker, I recognize my raisins, but also fish oil, rustic oak, very heavy. The nose develops. 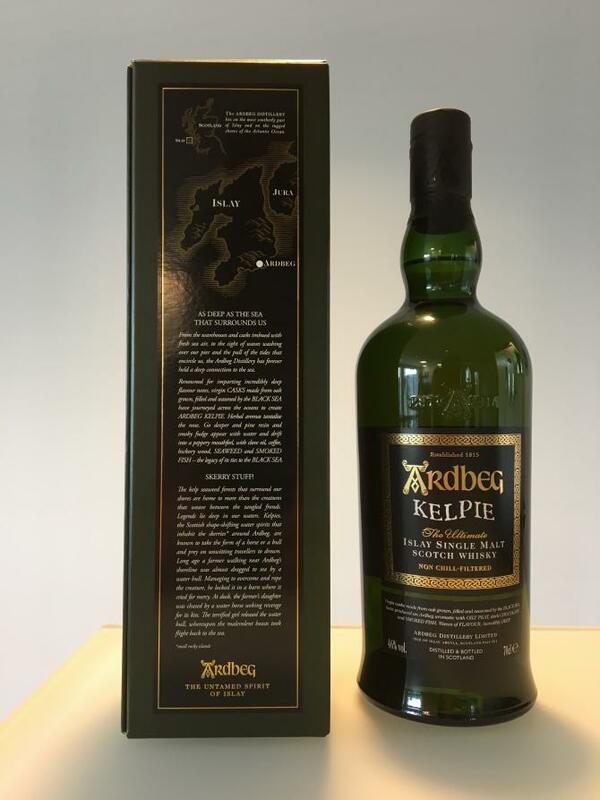 When Kelpie equal massive green notes come into the mouth, grass, bitterness, chicory, then bread, baked aromas, malt, oak, soot, peat, dense and only moderately sweet. the bitter aromas are quite dominant, the oak shows its hard side, as well as soot, peat, menthol and a hint of citrus. A, for me not quite typical, delicious Ardbeg. I find it very successful, even if opinions differ greatly. The Committee Release is for me but clearly the better variant of the two sea spirits. The 5% more alcohol makes the flavors stand out more and bring out additional flavors. In addition, the CR was in the issue price even cheaper than the generally available version. English breakfast. Baked beans with bacon and fried egg. A smoky note with a sweet touch. That's the smoke, too. The typical Aschenote is missing. After a while comes a strong pinch of sea salt and maritime notes (the kelpies?). In the background hides a light medical tone. Reminds me something about Hansaplast or Leukoplast. Everything is harmonious. The flavors are quite clear, but not really powerful. Here comes the ashes. Nice smoky touch. The sweetie comes afterwards. The maritime flavors also come through. Mainly the sea salt. A fairly strong chili sharpness follows and is then replaced by a slight bitterness. Relatively long. The bitter note holds, underlaid by his lingering sweetness, which still prevails in the end. 89 points. A very successful Ardbeg. He needs a lot of time in the glass but it pays. Whether the differences to the Core Range are so serious or not, everyone has to decide for themselves. I really liked it and got a nice character from the Schwarzmeereiche (or wherever). I like the normal Kelpie better than the Commi and therefore he gets one point more. Tasty, tasty, Ardbeg. Not no less. Great thing. J. Pleasant enough, industrial, smoky-rubber whisky, without any special undertakings, but solidly made, solid, soft. Restrained, dry, boards and grain, flavored with soft rubber notes, industrial textiles, new sneakers, sweet cream and confectionery colors, boiled condensed milk, caramel. Rich, soft, rubber, peat, ash, burnt branches, black pepper, mountain ash, burnt crackers, sweet notes. Spicy, warming, peat, coal, some rubber, mountain ash, ginger. Very nice piece of Islay, quite complex despite it's a NAS whisky (feeling a bit young though). Every sip gives a feeling of an ocean breeze (immediately after the first sip I recalled my diving trip on the Pacific). Typical Ardbeg sweetness feels after the smoke wave. It's a big pity that Kelpie isn't widely available anymore but still it can be purchased from some places.